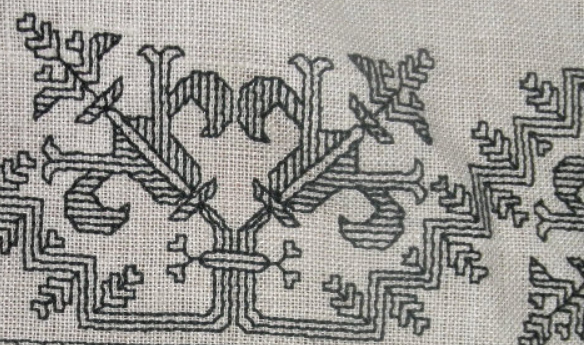 I’ve gotten lots of questions about blackwork, my methods, and products over the years. Some more than once. I’ll try to round some up and answer them here, for ease of reference. Feel free to post more in the comments, and if I have useful advice, I’ll answer them at a later date. It looks so perfect! Do you make mistakes? Lots. Continually. Sometimes at the same place in a design repeat, again and again. But for the most part, I carefully pick them out, using my needle tip, a really good pair of sharp tweezers, and if needed, something sticky (like blue painters’ tape) to tidy up any remaining surface fibers. I find that clipping a few key stitches on the front, then withdrawing the snippets from the back leaves the front of the work a bit neater, than does doing all of the removal from the front. Do you stitch guidelines to help with counting? No, I don’t. Or not in the way the asker probably means. I don’t establish a grid over my entire ground cloth, but I do usually run a basting thread (but not in specific count) along the extreme edges of my stitching area, and at the center (both laterally and longitudinally), so I know where my margins and center are. 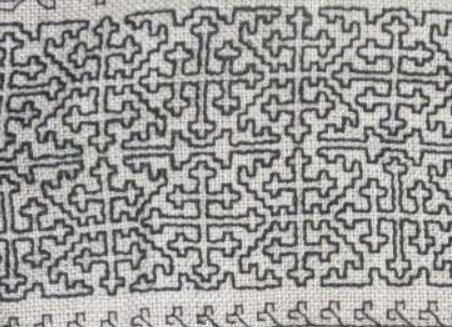 For example, as I began my forehead cloth, you can see the line below the growing stitching that marks the boundary of my work (in this case, instead of stitching directly up to it, I decided to stitch no closer than three units of it); plus the diagonal that bisects the established bit. That line marks the center. Sometimes on larger projects I might mark lines that divide my ground into quarters or thirds, too. It depends on the size of the project and what I am doing with it. 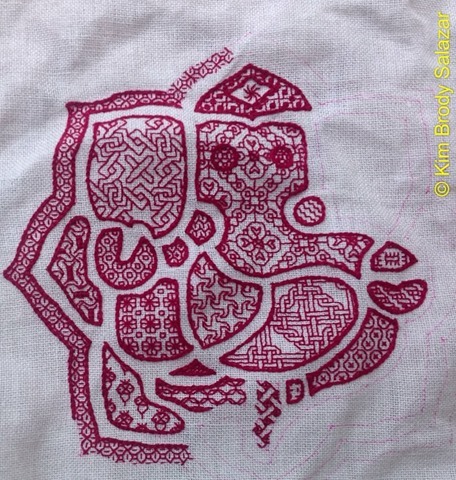 One thing to note – I have never stitched from a fully complete graph that shows the entire project. 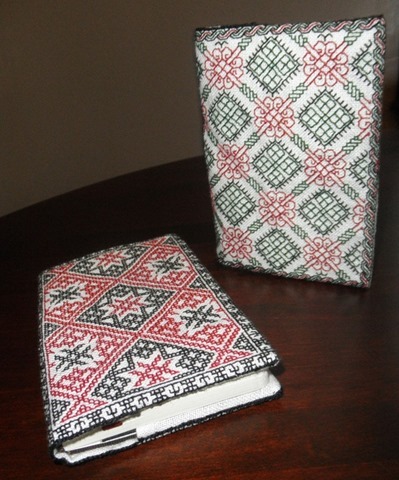 Yes, I know I published one here, but I am a “bungee jump stitcher” and more often than not, pick my patterns on the fly. The exception is of course, lettering. I do graph out my words or phrases, to work out problems in word or letter spacing, or to find the center of the motto (if I want the motto centered when stitched). Then how do you keep things aligned? I start from the center, as seen above, then work either right or left until I get to my desired width. Since most of my work is either a straight, or left-right or up-down mirror image or bounce repeat, I then go back and fill out the strip or pattern in the other direction, taking care to end at the same point in the repeat as the first edge. Do you ever draw in or otherwise mark your designs? 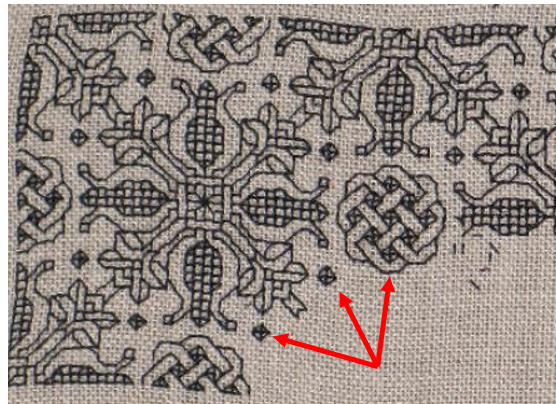 Yes, but mostly for inhabited blackwork, not strapwork. 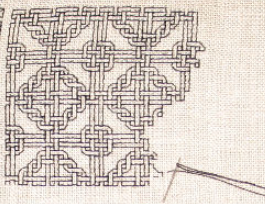 Inhabited blackwork is the “outlines plus fillings” subtype. 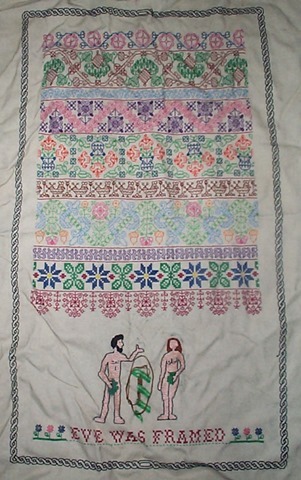 Strapwork is the substyle that produces long bands often used to edge household linens or garments. I’ve used a couple of methods to establish outlines for fills. First, there’s simple drawing. 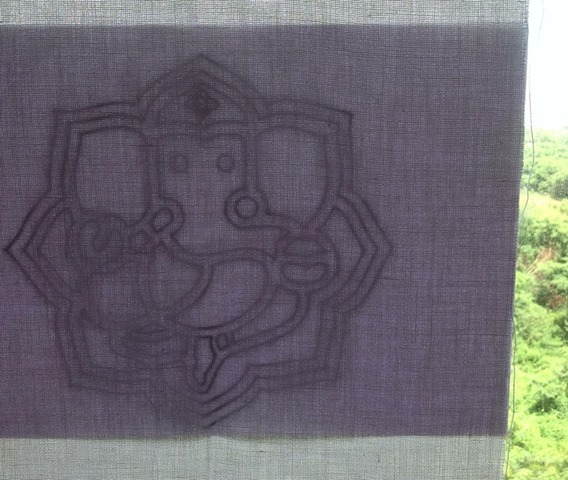 Here, I’ve taped my line drawing to a window, with the ground cloth on top, prior to tracing the design onto the cloth using a pencil. You can just barely make out the outlines in the in-process shot. And here I have established my design on the count, using small cross stitches to create the outlines for the shapes to be filled in. I finished off those heavy lines by overworking them with a nice, solid chain stitch because I wanted prominent outlines. I could have basted or done a lighter line of stitching instead. I’ve done that to make pounced chalk less transient, but I don’t have photos of in process works that employed chalk plus basting. Do you ever work in multicolor? Sure. Lots. Here are a few. Starting at the left top: From 1973, in high school, prior to my involvement in the SCA – a happy mash-up of sampler bands, still unfinished; small stitched Moleskine type notebooks covers done as an East Kingdom largesse donation in 2012 (I wonder if they ever were received, and to whom they were given); a band sampler as engagement present circa 1985 or so, for a friend whose wedding plans expired prior to completion of the sampler, which explains that one still being unfinished; the Trifles sampler, done about a year ago, as a perpetual nag for Younger Daughter to take with her to college; and the Permissions sampler done as a present for our Denizen, the same year. These recommendations are specific to the way I work. But my comfort level is not the same as everyone else’s, so if you do it differently, you are not wrong. A frame helps. Preferably a hands-free frame. 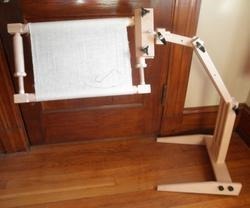 I like stiff tension on my stitching ground, so I prefer a nice, tight frame. But I stitch the fastest with one hand over and one hand below my work, so I am happiest with one that doesn’t require me to grow a third hand to hold it. My faves are my Millennium flat scrolling frame, held securely in my ancient Grip-It stand (I had to replace the bolts of the original to accommodate the Millennium’s thickness), and the Hardwicke Manor sit-upon round frame. 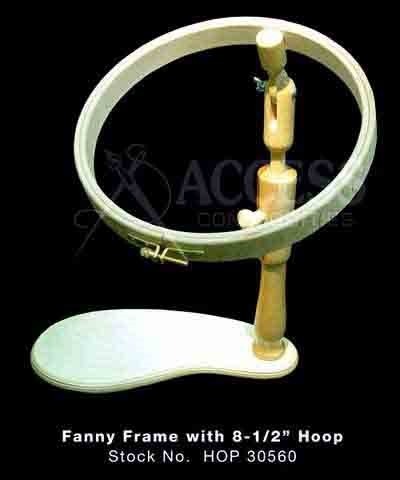 If I am using a round frame, hand held or sit-on I ALWAYS pad at least one of the hoops with twill tape, stitched securely down on the hoop’s inside. 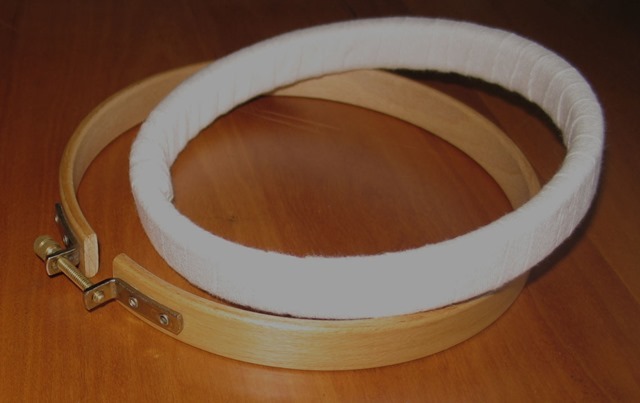 This increases grip, and protects stitches that are “hooped over” after they are laid down. 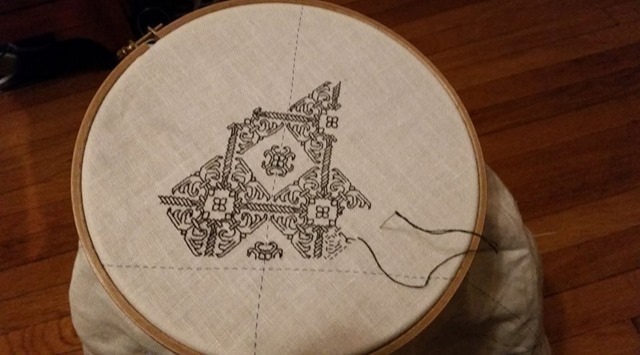 Since I am usually working on the count on relatively fine grounds (I prefer 32+ threads per inch, with 38-42 being my sweet spot, and 50+ just to show off), my stitches are usually short and not prone to damage from a round hoop. But if there is any doubt at all, I haul out the big boy and work flat. Needle choice can avoid headaches. For this sort of work you want a blunt tip needle to avoid splitting ground cloth threads. You want the needle to glide between them and not force them, to avoid disarranging the ground threads more than needed to accommodate passage of the stitching thread. Many people use tapestry blunts, but for the gauges I work with, often with just one or two strands of floss or thread, I find the large holes in tapestry blunts to be annoying. The threads slip out all too easily. 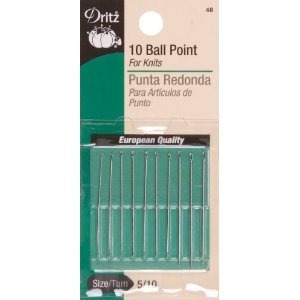 So instead I use these ball-point needles, intended for hand sewing on polyester knits. They are relatively easy to find in sewing stores where they are usually grouped with the regular (not embroidery) needles. Wax. This is a love-it or hate-it issue. I love it. I almost always run my thread through beeswax prior to stitching. It strengthens threads, avoids fuzz and shedding, makes threading and maintaining even thread feed on multi-ply floss better, and makes them glide through the ground. Yes, even silk. 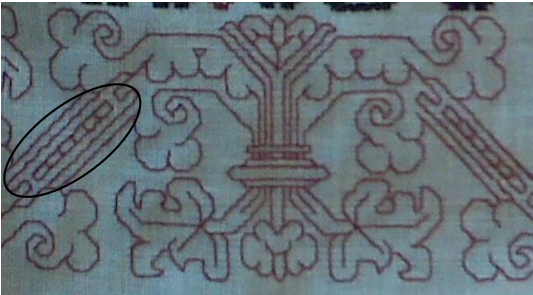 Since my chosen style of stitching uses extremely short stitches, the sheen of silk over a long run (like in satin stitch) is minimal at best. If I think that the wax will have an effect on the final product, I may only do it lightly, or restrict waxing to the final two inches that will be threaded through the needle, but I still do it. I keep one lump of beeswax for light color threads, one for darker colors, and one for black. Threads do shed or crock onto the wax, and using several little blocks keeps the lighter colors clean. And it must be beeswax. Candle wax doesn’t have the same properties, and can stain. Rarely. It’s a noble party trick, and useful for handkerchiefs, cuffs or collars viewed from both sides, but even historically, not always done. 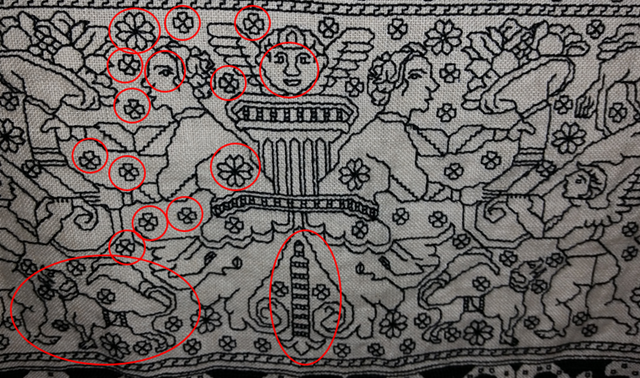 There are paintings that show different stitching patterns on the inside and outside of a collar band. 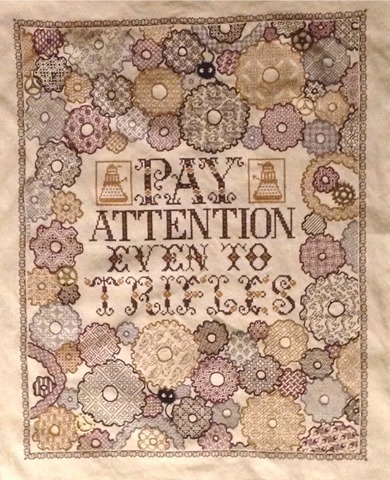 I do tend to use double-sided logic for most, but not all of my linear stitching. I find it saves thread, and I prefer the look and feel of the finished product. I’ve done some tutorials on how to determine baselines and stitching order (read from bottom up). I also confess to abject heresy if my pathing needs the jump and the final presentation form allows it. 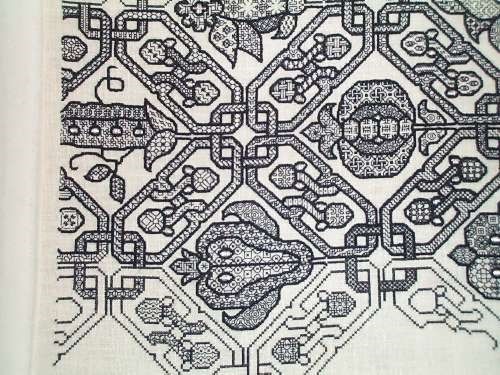 Most designs have several possible stitching paths. Which one I take can vary from repeat to repeat, depending on how much thread I have left on my needle, where I am headed after the current bit, or even plain old experimentation. The path planning for me is very relaxing, and I rarely get lost or paint myself into a corner because I use tricks to idiot proof my path (being the biggest idiot stitching on my work at any time). 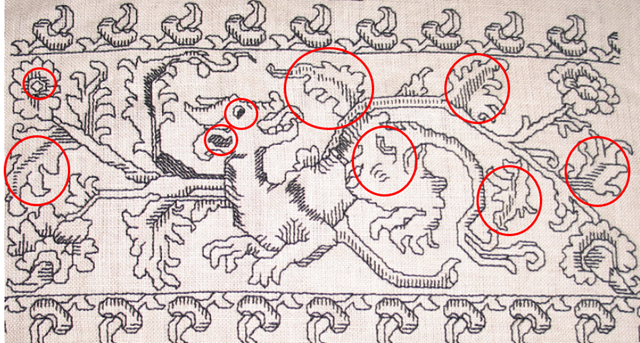 Never go off on a long limb, establishing a very long line of stitching that branches off the main work. 90% of the mistakes I make fall out from this, especially if lots of diagonals are involved. I prefer to proof my work, by trying to do it by section adjacent to or in line with prior work. I constantly refer back to the established stitching to make sure I am not off count. There’s no reason to fret about having enough thread to make the return journey. 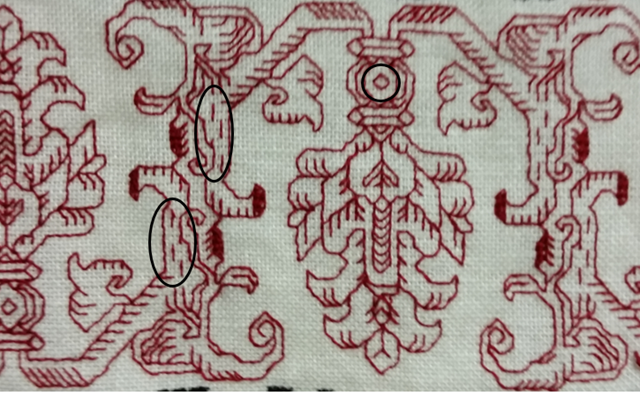 Many people stitch double running out in one direction until half their thread is used, then do the second pass, filling in the remaining stitches on their way back to the starting point. But they often run out and have a section left over to complete using a second thread. 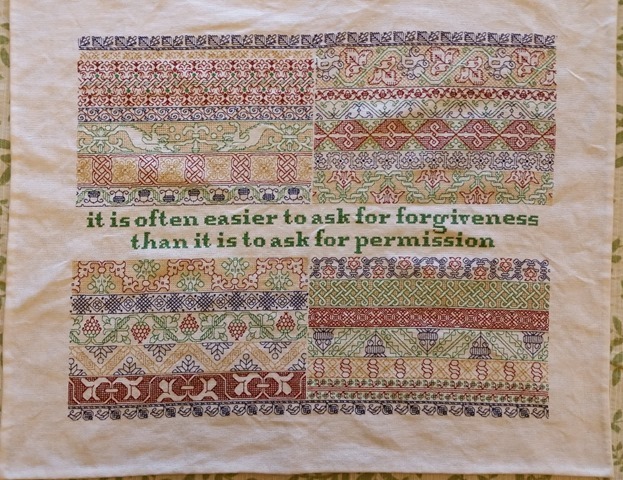 Instead of there-and-back-again, I head out in one direction, taking all detours, until my thread is used up, then rethread the needle and start again from the beginning point to fill in the every-other stitches. And (gasp) there’s no shame in using TWO THREADED NEEDLES, leapfrogging yourself an inch at a time if that helps you keep your place. In general it’s preferable to take every detour as it is passed, especially if it’s a branching dead-end. If I run out of thread during a detour, I pick up again from that point and complete the detour to return to the baseline, rather than starting the next pass from the baseline itself. That way I don’t get stuck in cul de sacs. 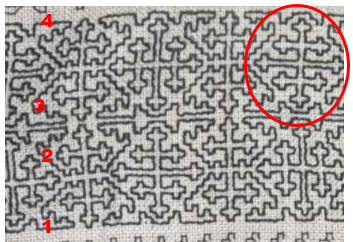 If there’s a joining that you don’t want to take as a detour, and it hooks up to the main design elsewhere (it’s not a branching dead end), it’s a good idea to work a stitch or two out on it, so there’s an attachment twig. When you come by later from the other direction, it’s lots easier to align with that twig than it is to judge proper place against an unbroken baseline. Those little spikes and shading lines that radiate from a baseline in the more complex designs are your friends. They make counting much easier. Work them on the first pass and use them as part of the proofing process. If you are using an even number of floss strands and thread grain isn’t a problem (and for most of short-stitch linear work, it isn’t) minimize knots by cutting your length twice as long as you need, folding it in half and waxing all but the loop just formed, and on the first stitch, catching the loop made to secure your end. If you are using an odd number of strands, or thread grain is an issue, and you don’t want to make a waste knot (which I rarely do for this kind of work), make a secure knot at the end of your thread, then use your needle to pierce the strand just below it, catching the thread in the same manner as #6 above. Your knot will be secured and will not pull through to the presentation side. Stitching over 2×2 threads is easiest. 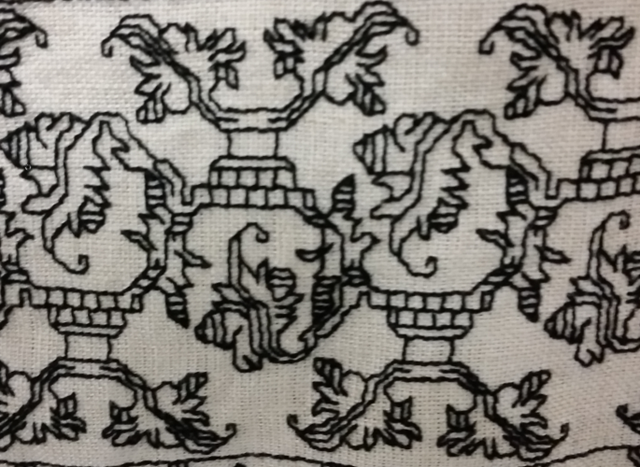 3×3 and 4×4 are also doable, but look better on grounds that are at least 40 threads per inch. You can tame a skew ground – like a piece of inexpensive linen or linen look alike NOT sold as even weave – by stitching over an uneven count. If for example, your ground has more stitches north-south than east-west you might stitch over 3 threads in the north-south direction, but 2 in the east-west direction. This does make a project more exacting, and I don’t recommend it for someone who is just learning stitching logic.